Time to move into the big cap LICs? While we believe that over the longer-term, smaller companies provide more opportunities to outperform compared to larger ones, rarely have we seen such a large performance gap between the two as we have over the last 12 months. As shown by the Standard & Poors index numbers below, the ASX20 stocks have delivered total returns including dividends of just 0.6% in the year to 30 April. Compare that to the ASX small ordinaries at 18.4% and ASX Emerging Companies at 25.0%. We believe it is likely that at least some of that performance gap is likely to reverse in the next 12 months. We saw the beginning of that in April and, so far in May, it has continued. For that reason, it makes some sense to at least own some LICs focussed on the bigger companies. We usually prefer small boutique managers, running differentiated investment strategies, that have a competitive advantage. So, in a way the opposite of this would be a large fund, that looks similar to a major index, investing in one of the most analysed sectors in Australia. Argo Investments Limited (ASX: ARG). Both are very large (AFI is over $7 billion and ARG is over $5.5 billion) and very old (AFI has operated since 1928 and ARG since 1946). Both have performed very similarly to the ASX 200 Index on a portfolio level over the longer term, and are managed very cost efficiently. If you are looking for market equalling performance and consistent dividends, then look no further. However, if you are looking to outperform the index by any reasonable amount over the longer term, these two LICs may not appear so exciting. That is until you remember that these are LICs and therefore can trade at values above or below their NTA (or the value of the underlying investment they own). Given their characteristics, and our preferences, you would think it would be rare for us to own these large LIC’s. But we do own them from time to time, and we’ve recently begun accumulating both again. For us, owning the large, mainstream LIC’s that everybody else always owns is a contrarian play. 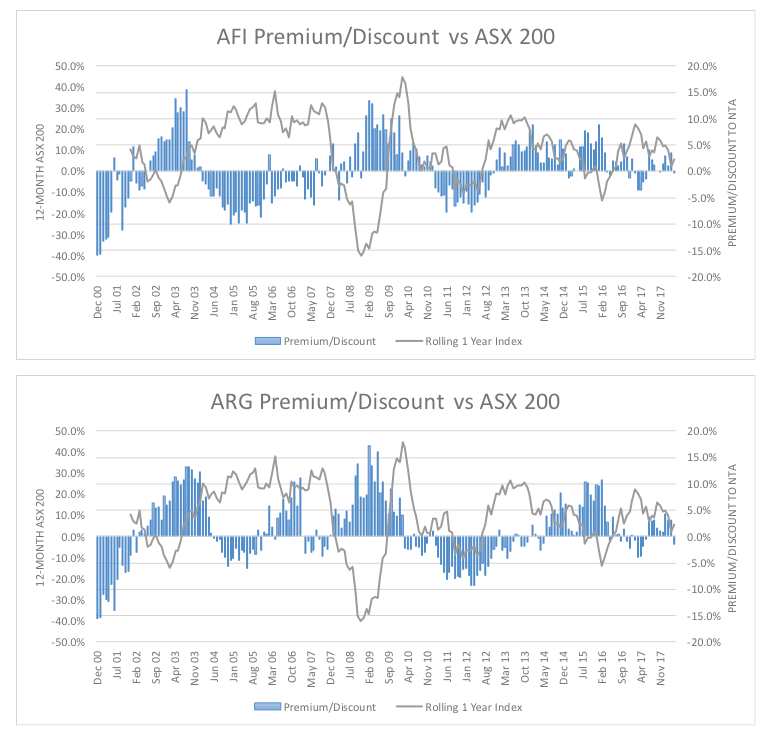 The following graphs show the monthly premium or discount to NTA since 2000, compared to the 12-month historical return for the ASX 200 Index for each of AFI and ARG. Both AFIC and Argo move in cycles of premiums and discounts to NTA. At times this is somewhat explained by a run-up in the share price before dividends, but at other times it’s not so clear. We would suggest not buying one of these LICs at a large premium to NTA, given that historically premiums have always given way to discounts. Given that we believe there is very little chance their portfolios will substantially outperform the market over the long-term (based on performance history), buying at a premium will likely lead to underperformance. If you want market exposure and very low costs, perhaps consider an ETF instead until the large LICs trade at a discount again. During sustained market falls, these larger LICs have historically moved to reasonably large premiums. For both AFI and ARG, the tough periods in the early 2000’s and GFC saw them move to 10% plus premiums to NTA. While the underlying investment portfolios generally moved lower with the market, shareholders fared relatively better (lost less) due to the discount moving to a premium. This makes AFIC and Argo potential shock absorbers in a market downturn. They help take the edge off any drawdown. One common theory for this phenomenon is that during favourable market conditions when equities are generally trending upwards, investors feel confident making their own stock calls. When equities prices start falling, they move their exposure to the larger LICs which they see as a “safe pair of hands”. As at early May, both are trading at slight discounts after about a year of trading at a slight to moderate premium. They are starting to look interesting again. Because of the discount and the underperformance of ASX20 stocks over the past 12 months, which feature heavily in both portfolios, we have started accumulating both in our Affluence LIC Fund. We will look for a bigger discount before either of these moves to a more substantial position in our portfolio. We are cautious on the general market given the ASX 200 is currently trading above fair value at around 6100. Therefore we appreciate the potential shock absorber that these vehicles can provide. There are also two other mainstream LICs from the AFIC stable that we have positions in. The AFI investment team manages this LIC. However, unlike AFI, the portfolio comprises both large and small companies. It is much smaller than their other LICs, with a market capitalisation of circa $240 million. Performance has been reasonable over the short to medium term and quite strong over the longer term. What we like most about this LIC is that it is currently trading at a circa 8% discount to NTA, versus a 5-year average discount of around 2%. This LIC only pays a dividend once per year, normally in August. Previous years has seen the NTA discount reduce/premium increase between May and August as investors buy in to receive the once a year dividend. DJW has a market capitalisation of over $700 million and primarily invests in ASX 200 shares. One of the primary goals of DJW is to pay an enhanced level of fully franked dividends to investors. The company utilises a buy/write strategy to assist in this goal. This means it purchases shares that have an active options market and sells call options to generate additional premium income. In practice, this has the effect of converting future potential capital gains into income today. Distributable income to Djerriwarrh investors is therefore comprised of franked dividends received from holding shares, option premium received from selling call options, and realised capital gains from the share portfolio. For many years DJW traded at a very substantial premium to NTA. This was most likely due to the high level of franked dividends the company continued to pay out. From 2007 to 2015 the company paid an annual dividend of 26 cents per share, fully franked. At one point this resulted in the LIC trading at a more than 40% premium to NTA! However, in 2016 the company made the decision that the 26 cents per share could no longer be supported. For the last year, the company paid out 20 cents per share, fully franked. In early May DJW traded at a slight discount to NTA, compared to its 5-year average of a 22% premium. We expect that 20 cents per share is the new base level dividend. However, there are no certainties that it won’t be reduced further. Based on the current share price of $3.26, this represents a 6.1% net yield and an 8.8% gross yield including franking credits. While we cannot be sure that the discount won’t get bigger, or that the dividend won’t be cut further, we have started accumulating a position in DJW at NTA or less. We encourage you to do your research before investing in any LIC. Remember, a great LIC and a great manager is only part of the story. We also like to make sure they’re trading at the right price and that the assets they are investing in are not themselves overvalued. We explain how we do this in our LIC Guide, but it’s up to you to make the investment decision that’s right for you, in conjunction with your financial advisor if you have one. Disclaimer: This article has been prepared by Affluence Funds Management Limited ABN 68 604 406 297 AFS Licence no. 475940 (Affluence) to enable investors in Affluence Funds to understand the underlying investments of the funds in more detail. It is not an investment recommendation. Prospective investors are not to construe the contents of this article as tax, legal or investment advice. Neither the information nor any opinion expressed constitutes an offer by Affluence, its subsidiaries, associates or any of their respective officers, employees, agents or advisers to buy or sell any financial products nor the provision of any financial product advice or service. The content does not consider your objectives, financial situation or needs. In deciding whether to acquire or continue to hold an investment in any financial product, you should consider the relevant disclosure documents for that product which are available from the product provider. Affluence recommends you consult your professional adviser to determine whether a financial product meets your objectives, financial situation or needs before making any decision to invest. As of end of April, the ASX200 accum total returns p.a. versus AFI and ARG over the past 1, 3 and 5 yr periods ( inlud divs reinvested ) 1 3 5 10 ASX 200 5.46 5.7 7.53 5.3 AFI 7.47 2.95 5.55 5.3 ARG 5.51 3.54 7.21 4.7 note that AFI has significantly underperformed the index over the past 3 and 5 yrs and ARG hasn't even matched the index over 10 yr period. net asset per share growth + dividends is also unimpressive with notable underperformance vs the index over the past 1, 3 and 5 yr periods, although matching over 10 yrs 1 3 5 10 AFI 4.1 3.4 6.0 5.3 ARG 3.1 4.3 6.7 5.2 by comparison WAM Leaders investment portfolio has risen by 14% over the past 12 months as per their latest monthly update. given the underperformance over the past 5 yrs, I would make the following conclusions * AFI and ARG over some considerable periods of time do not give index equally performance. * they don't deserve their current premiums to NTA and it staggers me that they are currently trading at premiums. whereas WAM Leaders whose underlying portfolio has significantly outperformed the index over the past 12 months still trades at a discount. I have also done some research on LIC'S, and have been investing in them for a number of years, and I have found these 3 - WAM, DUI, WAX offer a generous dividend and also a higher return than the one's mentioned in the article, over 3,5,and 10 years. Soul Pattinson SOL offered the best return over 10 years from the companies I was interested in. WMI Microcaps also has a good result for a newly listed LIC.